Keeping and Breeding Retroculus xinguensis Gosse 1971by Lee Newman. An object of desire finally appears … and does not disappoint. The Blue-eyed Cichlid, Cryptoheros spilurus (Günther, 1862) by Juan Miguel Artigas Azas. An overview of a feisty denizen of Central American clearwater. A Tanganyikan Cichlid of a Different Shape: Asprotilapia leptura Boulenger, 1901 by Thomas Andersen. Behavior and form that can make even the most veteran aquarists grin. The Endemic Tilapia of Lake Bermin by Claudia L. Dickinson. Speciation results in a flock of small, colorful tilapiines. What could be better? 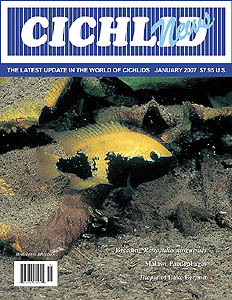 Paedophagy in Malawi Cichlids by Ad Konings. A lake full of mouthbrooders enables some intriguing feeding strategies. My Favorite 6 Cichlids – Anton Lamboj takes on the impossible task of narrowing down his favorites to a list of six.